Ever since MY SISTER’S GRAVE shot to the top of Amazon’s bestseller list in 2014, readers have come to look forward to a new Tracy Crosswhite thriller every year. As a detective gifted --- but not supernaturally so --- with a keen eye, sharp wit and warm heart, Tracy Crosswhite makes for a wonderful protagonist whose interesting cases are not only perfectly paced but also morally intriguing. His latest novel, IN THE CLEARING, throws Tracy headfirst into a brand new mystery with life-changing repercussions for one small town. In this installment of the series, Tracy is finally settling into a more stable routine, free of personal cases and vicious stalkers. Instead, she is faced with a bizarre murder in which an affluent woman has confessed to shooting her husband in plain view of their 18-year-old son. Dugoni quickly lays out the facts, but it is easy to see why the pieces do not add up. While the woman is bruised, there are no prints on the weapon her husband supposedly used to beat her. The son’s prints, meanwhile, have been found on his father’s shoe, despite his report that he was not involved in the murder. It’s an interesting case, to say the least, but another more complicated case soon falls into Tracy’s lap. "As usual, Dugoni plots a compelling and well-paced read, and his talent for balancing two seemingly unrelated storylines is superb." Fans of Dugoni’s series know that Tracy regularly trains fellow female officers to be outstanding shooters --- not, as one may suspect, because she is easier on them as a woman, but because she is far tougher than her male counterparts. As a woman who faced numerous counts of sexism on her rise through the ranks, she knows how to prepare her female colleagues to enter the force. But when Jenny, one of her protégés and friends, reaches out with a 40-year-old cold case, Tracy enters a whole new playing field. Forty years ago, the small town of Stoneridge was rocked by the horrific death of a young Native American girl named Kimi Kanasket. At the time, the town was celebrating a series of football wins by honoring four teenage players. Known as the Iron Horsemen, these young men shepherded in a new era for the small, unassuming town accustomed to losing. The death of Kimi, however, cast a dark mark on the town and piqued the interest of new detective Buzz Almond --- Jenny’s father. Following Buzz’s death, Jenny discovers a secret file about Kimi in his office and invites Tracy to come investigate. Recalling the terror of her own sister’s death, Tracy readily accepts. So what happened to Kimi? The official record states that she hurled herself into a river following a bad breakup --- but the truth is never quite so simple in the small towns of fiction, with their tight-knit communities and dedication to preserving honor. As Tracy investigates, it becomes clear that Buzz knew the real cause of Kimi’s death, but what is unclear is how and why he was unable to prove it. Using modern technology and expertly skilled colleagues, Tracy must track down Kimi’s killer and give her heartbroken family the closure they have needed for decades. At the same time, she must balance the demands of her current workload and her relationship with Dan. For a less high-stakes thriller than MY SISTER’S GRAVE or HER FINAL BREATH, IN THE CLEARING is no less suspenseful or intriguing than Tracy’s earlier adventures. 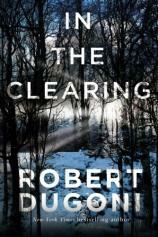 As usual, Dugoni plots a compelling and well-paced read, and his talent for balancing two seemingly unrelated storylines is superb. I must admit, though, that I found the plot a bit more predictable than his previous works. I cannot say that I figured out every aspect of either case, but parts of each felt a bit more obvious than I would have liked. On the other hand, it was refreshing to see Tracy solve a case in a more relaxed setting, and I truly enjoyed reading along as she investigated. If Dugoni can add a bit more drama to his fourth Tracy Crosswhite book, I think he will have achieved the perfect balance. Though perhaps not as dramatic as MY SISTER’S GRAVE or as terrifying as HER FINAL BREATH, Dugoni’s latest effort is an impressive addition to the Crosswhite canon and one that is sure to entice new readers and leave other fans hungry for more. I look forward to seeing where Tracy heads next.